Whoa! Wait!! It’s THURSDAY already?! Did anyone else just blink and find the week almost gone??? I was meaning to post this on Monday (well, longer than that actually) because this is something kind of BIG! 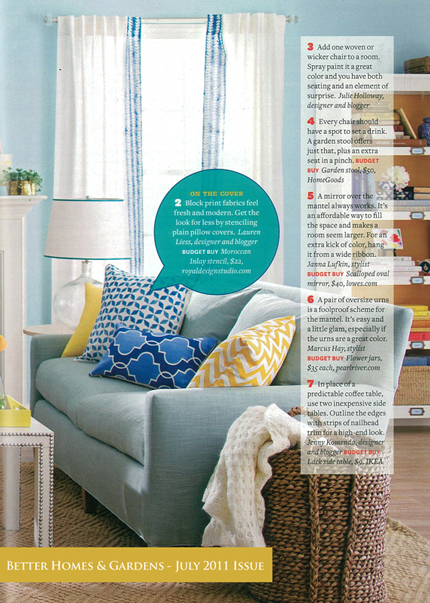 A few months ago, we received a request for a bunch of stencils from our Moroccan stencil collection from Better Homes and Gardens for a possible feature in their July issue. They had actually chosen stencils to use from another company already (not sure which one), but when they saw ours they decided to make a switcheroo. They “hinted” at a possible cover shot, but couldn’t say for sure, and we waiting patiently with fingers drumming…. You can imagine how THRILLED we were to see our Small Chez Ali stencil used on multiple pillows on the cover, as well as some great interior shots! You can imagine that we are cutting a LOT of Endless Circle Lattice stencils these days with this beautiful blue wall stencil application to showcase it! 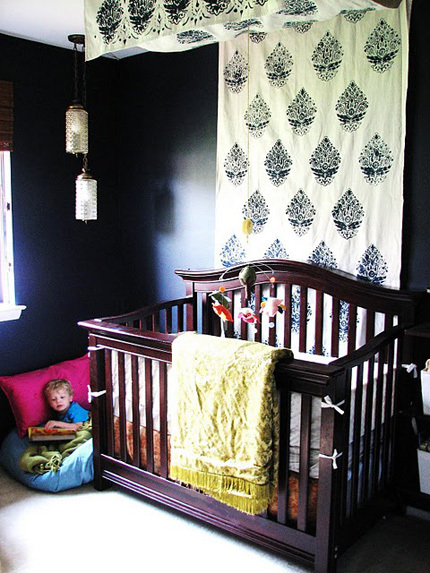 There is even more great stenciling shown on another page where they used our Moroccan Inlay stencil on even more stenciled pillows, and the darling Chicken Stitch stencil on some curtains. 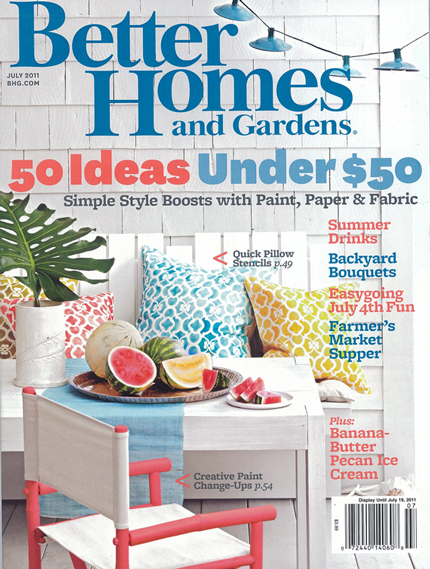 As you would expect from Better Homes and Gardens, they did a fabulous jot with the styling and photography, and we are so appreciative to see our stencils put to such gorgeous use! More stencil excitement! 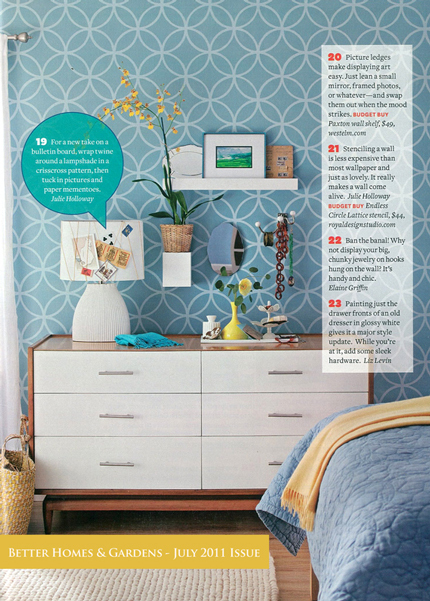 Just yesterday, a friend turned my on to this “Decorating Rules You Can Break” feature on the Better Homes and Gardens website that shows our Japanese Kyoto stencil cleverly used as a feature panel between two curtains on a wall. How cool is this! A lot of times you don’t necessarily want to stencil an allover pattern “allover” and the coordinating curtains provide a nice frame. I could totally see this idea working on a bed wall, with the stencil pattern acting as a “headboard” that is softly framed by the fabric! But wait! 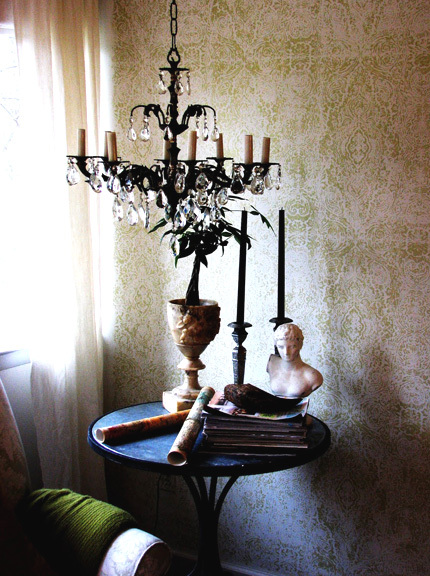 There’s even MORE to this stencil tale!! One of the bloggers featured in the July Better Homes and Gardens article is the talented designer, Lauren Liess of PureStyleHome. While I was enjoying perusing her delightful blog yesterday, I stumbled upon a great stencil project that she did for her nursery. 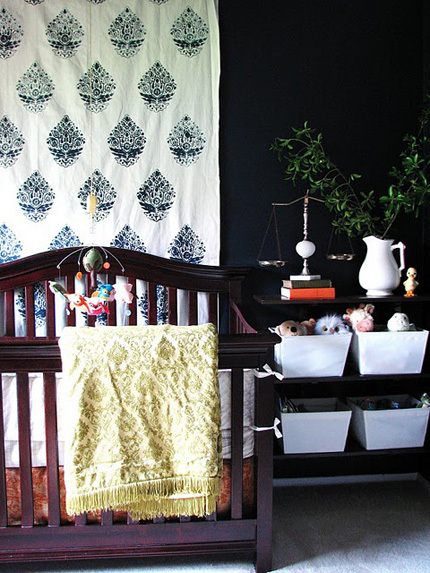 This clever canopy is actually a canvas dropcloth that she stenciled with our Small Indian Paisley stencil motif in a repeat pattern to create a damask effect. Notice how she repeated the same motif on the front drop of the canopy to create a stenciled border. Simply. Brilliant! 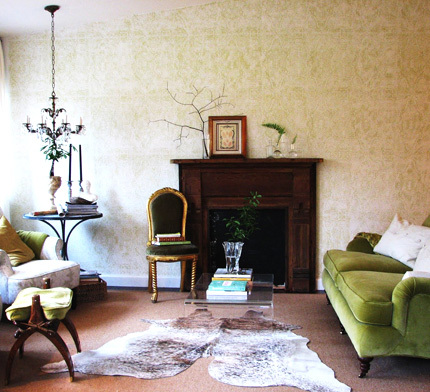 Lauren has some other smashing stenciling in her home, via a classic Ralph Lauren stencil pattern. Isn’t this a great look?? I love the color and, even more, the fact that her sweet husband actually did the stenciling for her. Good man!! Well, that’ s my big stencil news for this week. Pretty exciting, huh?? I love the paisley canopy idea. I wonder if i could do something like this on silk organza or something translucent? Melanie, congratulations for these wonderful features!!! You really have earned it with your outstanding and so inspiring and inspirational work. You are on a roll!!!! PS -I really regret that I am so far away from you – how I would love to see your work in reality!!! Congratulations! Kudos to you and your staff! Congrats! And definitely well deserved. Awesome! So happy for you that you got the cover. I’ll have to go run out and buy a copy now. Kudos to you and Congratulations!!! Anyway,Loving the paisley canopy idea of yours.You’re definitely brilliant! thanks for sharing. 🙂 Love your site too. I do like the way you have framed this particular concern plus it does supply me some fodder for thought. Nevertheless, because of everything that I have witnessed, I just simply trust when the actual feedback pile on that people today stay on issue and not start on a tirade associated with some other news du jour. Still, thank you for this fantastic point and although I can not really agree with it in totality, I respect the point of view. hello, fantastic article, and a really good understand! just one for my favorites. To was a impressive publish. It is inspiring pro all. Appreciation pro sharing to occurrence…. Mega good! Interesting article over here. It is pretty worth enough for me. Personally, if all website owners and bloggers made good content as you did, the net will be much more useful than ever before. I could not refrain from commenting. I’ve spent 2 hours searching for such article. I will also share it with a couple of friends interested in it. I’ve just bookmarked this web. Finished with the search done, I going to visit some model gay cams. Thank you very much!! Greetings from San Francisco! Hola! I’ve been reading your website for a while now and finally got the bravery to go ahead and give you a shout out from Austin Tx! Just wanted to say keep up the good job! It’s a shame you don’t have a donate button! I’d definitely donate to this excellent blog! I guess for now i’ll settle for bookmarking and adding your RSS feed to my Google account. I look forward to fresh updates and will share this site with my Facebook group. Chat soon! obviously like your web site however you have to check the spelling on several of your posts. Many of them are rife with spelling problems and I find it very bothersome to tell the truth however I’ll surely come again again. I like the helpful information you provide on your articles. I’ll bookmark your blog and take a look at once more right here regularly. I’m moderately sure I’ll learn many new stuff right right here! Best of luck for the following! Any time you complete a around Big Big Baller game, you will earn coins and experience points. Furthermore, it is possible to check out a video to increase twofold the total coins you actually earn. And therefore, it is possible to spin for an additional such as a chest full of coins, which is often worth anywhere between 50 and also three hundred coins at the same time. I was curious if you ever considered changingthe page layout of your blog? Its very well written; I love what youve got tosay. But maybe you could a little more in the wayof content so people could connect with it better.Youve got an awful lot of text for only having 1 or 2 images.Maybe you could space it out better? I really enjoy reading on this web site , it has great blog posts. “One doesn’t discover new lands without consenting to lose sight of the shore for a very long time.” by Andre Gide. Excellent web site. A lot of helpful information here. I’m sending it to a few pals ans also sharing in delicious. And obviously, thank you on your effort! Heya my business is somebody in charge of right here. I stumbled upon this particular plank so i to get It truly valuable & that solved the problem out and about significantly youtube terbaru. I hope to produce one thing returning and also guide people like you made it easier for everyone. Do you mind if I quote a couple of your posts as long as I provide credit and sources back to your website? My blog is in the exact same area of interest as yours and my visitors would definitely benefit from a lot of the information you present here. Please let me know if this ok with you. Cheers! hello!,I love your writing so a lot! share we be in contact more about your post on AOL? I require a specialist on this house to unravel my problem. May be that’s you! Taking a look forward to look you. Good post. I study something more challenging on different blogs everyday. It would at all times be stimulating to read content material from other writers and apply somewhat one thing from their store. I’d favor to make use of some with the content on my blog whether or not you don’t mind. Natually I’ll give you a link on your web blog. Thanks for sharing. Good one! Interesting information over here. It is pretty worth enough for me. Personally, if all website owners and bloggers made good content as you did, the web will be much more useful than ever before. I couldn’t resist commenting. I have spent 2 hours searching for such informations. I will also share it with some friends interested in it. I’ve just bookmarked this web. Right now with the search done, I’ll watch some model gay Webcams. Thanks!! Greetings from Austin! I am really enjoying the theme/design of your website. Do you ever run into any web browser compatibility problems? A few of my blog readers have complained about my blog not working correctly in Explorer but looks great in Firefox. Do you have any ideas to help fix this problem?